Subscribe to The Profit Newsletter Today! Cut Through the Confusion & Misinformation & Discover What You Really Need to Know to Make Money as a Successful Real Estate Investor! No Hype… No Bull… Just Straight Answers from America’s Foremost Real Estate Investing Experts! Click Here to Get Your FREE Subscription to The Profit Newsletter Today! What do you really need to know to make money as a real estate investor in the Tampa Bay Area? Find out in this powerful newsletter that features the hottest, most successful real estate investors from all over the country. We’ve named this newsletter “The Profit” because it’s all about your real estate investing profits and how to increase them. You’ll go behind closed doors and learn from some of this market’s best real estate investors and biggest success stories – and you won’t have to pay an arm and a leg or waste hours of free time to do it. 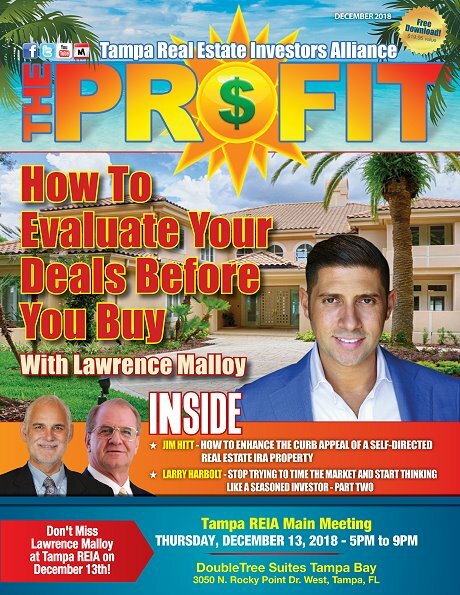 Each month The Profit brings you straight-shooting, hype-free stories that reveal the practical, real-world strategies, tips and industry news that Tampa real estate investors need to know to succeed. At Last! You Can Get Proven, Real-Life, ‘Here’s How You Do It’ Advice on How to Succeed as an Tampa Bay Area Real Estate Investor! How to develop the mindset of a millionaire real estate investor! Secret formulas and strategies that will put you squarely on the fast track to real estate riches! How to have motivated sellers calling you day in and day out! Hands down the best wording to use in your marketing campaigns! The absolute most effective type of marketing you could possibly do to generate high quality, responsive leads! The magical question that gets right to your seller’s bottom line with no haggling at all! Key ways to build your own personal buyer’s list – FAST! Common problems you will eventually run into and how to overcome them! You Won’t Find Honest, Straight-Forward Information Like This Anywhere Else! This newsletter is carefully crafted to cut through the fluff and give you the essentials you need to know to make money investing in real estate in Tampa – or anywhere else in the world for that matter. Each issue is like having a private lesson with a real estate investing expert sent right to your computer. “I love it! Very professional and packed with great information.” ~ Jennifer E.
Subscribe to This FREE Newsletter Today! It doesn’t matter if you are new to real estate investing or an experienced investor looking to grow your business, this newsletter month in and month out delivers the tips, techniques and secrets that will help you do better deals and make more money. So don’t delay, subscribe now! If this newsletter isn’t everything you were expecting you can cancel your subscription at any time. To subscribe please fill out the short form below. Remember, this subscription is 100% FREE! Subscribe Now!